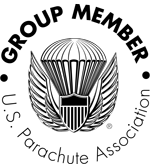 On February 4th, over 200 skydivers and friends, some local, some from other dropzones, came together for a fun filled day. The hangar was packed! Happy laughs and hugs filled the air. Many friends hadn't seen each other since the summer. These crazy people braved the 30-something degree cold and spent the whole day jumping from our new Grand Caravan. Bundled up with a brazillion layers, gloves and full­face helmets, they took to the chilly February skies, and made over 250 jumps. After sunset, the party started, the Fahrenheits went up along with the proofs of the warming potions, and everyone’s inner child came out to play. 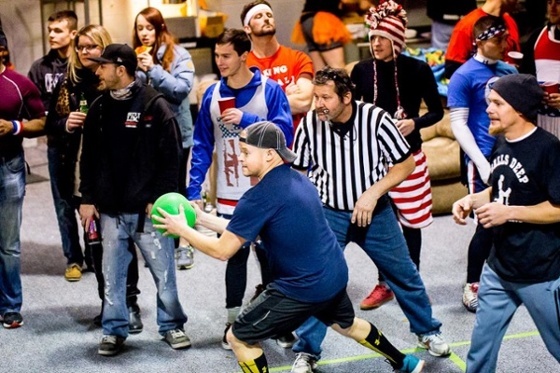 Twelve teams competed for the winning spot of the famous Dodgeball tournament. The war was on! They say there are no fans like Philly fans, but what they really mean is there are no fans like Cross Keys fans. The chant of “Cross Keys, Cross Keys, Cross Keys” taunted the other players. In the finals, it was the Army team VS “The Whisky Ticks” (named after a beloved household backwoods band). The pressure was on! How could this group of semi coordinated hooligans beat the Army? With all their training and prouse, they should be a shoo-­in, right? Wrong. Whisky Ticks, the crazy group of CK regulars, won the game! As said by many sports radio announcers, “The crowd went wild!’ The carpets were filled with drinks from all the cheers being made. Shoulder rides of the winning team were given, many a middle finger was given out, mouths wide open screaming! This was truly a night to remember, and if you missed it, make sure to stop by in 2018!